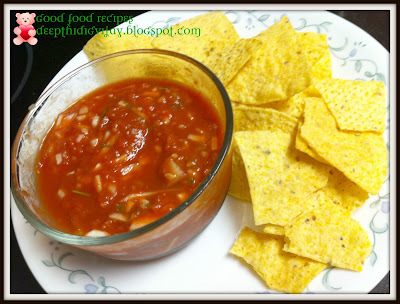 Salsa is a kind of dip/sauce a very famous and healthy Mexican food. I am a vegetarian, it is really hard to find the vegetarian food in Kentucky. I really had a bad experience in one china restaurant "East meets West", that day when I have been there, they arranged a buffet system. That means we have to serve our self and the meals will be placed at one place. My hubby is non vegetarian and he served what he like and sat on a table waiting for me. I went there and I was really confused with the vegetarian food and non vegetarian. In noodles I saw a shrimp, when I asked the server he said it was vegetarian noodles but some one by mistake would have thrown that in noodles. My God!!! that was really horrible, because the noodles was only food that are vegetarian in that restaurant. I will never visit that restaurant again. One fine day my hubby took me to Mexican restaurant and I found really good vegetarian dishes there, they first served Salsa with triangles. Wow that was fabulous. From then that became my favorite. Enough of the story and now let's see the preparation. Take tomato puree in a bowl. Grind green chili, little salt and garlic cloves in a hand grinder and add it to the tomato puree. Add cilantro, onions, lemon juice, vinegar, pepper powder and salt to taste. Mix well and serve with tortilla triangles. Salsa looks very colorful and tempting. Love it. i too have tried salsa at home..your recipe sounds easy n spicy...very nice DD!! !